KickFire™ IP-to-Company API enables Captora to offer its customers higher company identification rates for all users visiting its landing pages leading to greater personalization opportunities and increased conversion rates. KickFire delivers the best results for company identification, quality of firmographic data, and API response time. 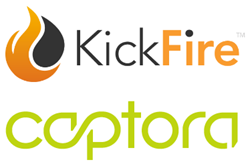 The leader in IP address intelligence and company identification technology, KickFire, today announced a partnership with Captora, the leading Top of Funnel (ToFu) Digital Marketing platform. By deploying KickFire’s advanced IP-to-company intelligence, Captora customers will now see a significant increase of company identification for all visitors to a Captora landing page. With the new partnership, B2B marketers will be able to drive greater personalization and increased conversion rates across search, advertising, and social channels with Captora’s Top of Funnel solution. “We were very pleased with KickFire’s test performance during our evaluation which led to this new and exciting partnership. KickFire delivers the best results for company identification, quality of firmographic data, and API response time – all three metrics being critical components for a successful implementation of form-shortening and advanced personalization that our customers requested,” said Joseph Rozenfeld, Senior Vice President of Engineering at Captora. KickFire deploys its proprietary TWIN Caching intelligence across its entire product suite of lead identification and real-time intent solutions. Optimally suited for Account Based Marketing (ABM), Predictive, Intent, and website content personalization, KickFire API provides the most accurate IP address intelligence and B2B firmographic data in the industry. KickFire’s B2B sales automation tool, LIVE Leads, uses TWIN Caching technology to enable companies to tap into their website’s invisible pipeline by identifying anonymous web visitors showing real-time buying intent for their products and services. KickFire is the leader in cloud-based B2B sales automation and IP address intelligence. The KickFire solutions are powered by TWIN Caching, an advanced, proprietary IP-to-company identification technology. TWIN Caching systematically caches and analyzes nearly four billion IP addresses, going beyond traditional IP association to uncover last-mile connectivity ownership. KickFire’s complete suite of solutions enables companies to tap into their website’s invisible pipeline and transform anonymous visitors into actionable sales opportunities. VisiStat, Inc., doing business as KickFire, is a privately held company founded in 2005 and based in San Jose, CA. To learn more about KickFire, visit kickfire.com, call 408-493-0456 or email sales(at)kickfire(dot)com. Captora was created to revolutionize digital, top-of-funnel, marketing. Captora helps marketers intelligently scale and optimize digital marketing campaigns to accelerate pipeline—and capture new buyers before their competition. Companies like DocuSign, Marketo, ServiceMax, Innotas, and Host Analytics are leveraging Captora to significantly boost conversion of paid and organic results.